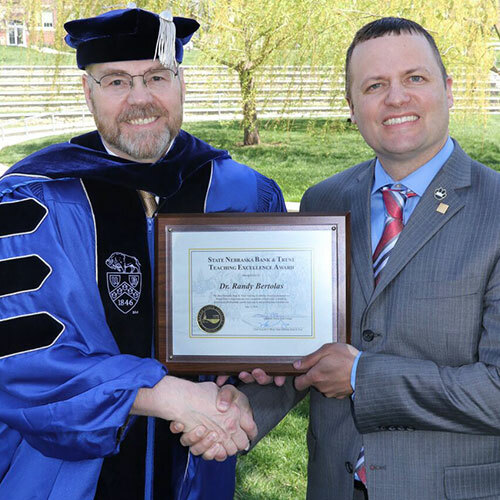 May 5, 2018 – Dr. Randy Bertolas, professor of geography and chair of the Department of History, Politics, and Geography at Wayne State College, received the State Nebraska Bank & Trust Teaching Excellence Award. Matt Ley, SNB’s CEO, presented the award at this year’s spring commencement. Dr. Bertolas has taught at Wayne State since 1995. He serves as faculty advisor to the Explorers Club, Pi Gamma Mu (the international honor society in the social sciences), and Phi Kappa Phi (the nation’s oldest and most selective all-discipline honor society). He chartered the WSC chapter of Gamma Theta Upsilon (the international geography honor society) in 2002. He is a member of the American Association of Geographers, the National Council for Geographic Education (NCGE), and the Nebraska State Council for the Social Studies (NSCSS). He also serves as coordinator of the Geographic Educators of Nebraska (GEON). Bertolas’ awards include WSC Student Senate Professor of the Year (2005 and 2009), the NCGE Distinguished Teaching Achievement Award (2006), the Pi Gamma Mu National Award of Excellence (2008), GEON Gildersleeve-Stoddard-Stone GeoEducator Award (2011) and the NSCSS Paul Beck Award for Outstanding Social Sciences Educator (2012). He also received the Nebraska State College System Teaching Excellence Award at this year’s spring commencement. David Ley, the bank’s Chairman of the Board, established the State Nebraska Bank & Trust Teaching Excellence Award in 1998 as a way of recognizing and strengthening outstanding teaching at Wayne State. This prestigious honor is awarded on the basis of rigorous standards that require a superior level of effective teaching. In addition, the recipient is presented with a check for $1,200. SNB supports the college in many ways such as funding scholarships and capital improvements, hiring college students as part-time tellers, and having employees serve on the Wayne State Foundation Board of Trustees.